November 23 is set aside for the commemoration of Clement of Rome on the Church Calendar used in the LCMS. Clement (ca. 35-100 AD) is remembered for having established the pattern of apostolic authority that governed the Christian Church during the first and second centuries. He also insisted on keeping Christ at the center of the Church’s worship and outreach. In a letter to the Christians at Corinth, he emphasized the centrality of Jesus’ death and resurrection: “Let us fix our eyes on the blood of Christ, realizing how precious it is to His Father, since it was poured out for our salvation and brought the grace of repentance to the whole world” (1 Clement 6:31). Clement displayed a steadfast, Christ-like love for God’s redeemed people, serving as an inspiration to the future generations to continue to build the Church on the foundation of the prophets and apostles, with Christ as the one and only cornerstone. 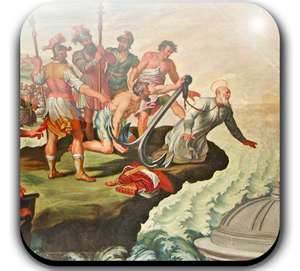 Tradition indicates he suffered a martyr’s death by drowning, being tied to an anchor. Clement was probably the fourth bishop of Rome, the third after Peter, who is said to have ordained him. He may well be the Clement referred to in Philippians 4:3. Almighty God, Your servant Clement of Rome called the Church in Corinth to repentance and faith to unite them in Christian love. Grant that Your Church may be anchored in Your truth by the presence of the Holy Spirit and kept blameless in Your service until the coming of our Lord Jesus Christ, who lives and reigns with You and the Holy Spirit, one God, now and forever. Amen.